The Start menu is the main gateway to your computer's programs, folders, and settings. It's called a menu because it provides a list of choices, just as a restaurant menu does. And as "Start" implies, it's often the place that you'll go to start or open things. To open the Start menu, click the Start button in the lower-left corner of your screen. Or, press the Windows logo key on your keyboard. The Start menu appears. The large left pane shows a short list of programs on your computer. Your computer manufacturer can customize this list, so its exact appearance will vary. Clicking All Programs displays a complete list of programs (more on this later). In the lower left corner is the search box, which allows you to look for programs and files on your computer by typing in search terms. The right pane provides access to commonly used folders, files, settings, and features. It's also where you go to log off from Windows or turn off your computer. One of the most common uses of the Start menu is opening programs installed on your computer. To open a program shown in the left pane of the Start menu, click it. The program opens and the Start menu closes. Clicking one of the program icons launches the program, and the Start menu closes. So what's inside the folders? More programs. Click Accessories, for example, and a list of programs that are stored in that folder appears. Click any program to open it. 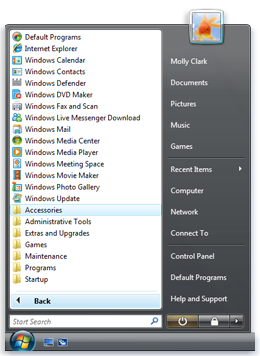 To get back to the programs you saw when you first opened the Start menu, click Back near the bottom of the menu. If you're ever unsure what a program does, move the pointer over its icon or name. A box appears that often contains a description of the program. For example, pointing to Calculator displays this message: "Performs basic arithmetic tasks with an on-screen calculator." This trick works for items in the right pane of the Start menu, too. 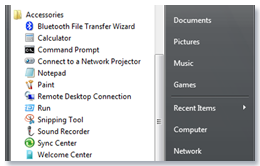 You might notice that over time, the lists of programs in your Start menu change. This happens for two reasons. First, when you install new programs, they get added to the All Programs list. 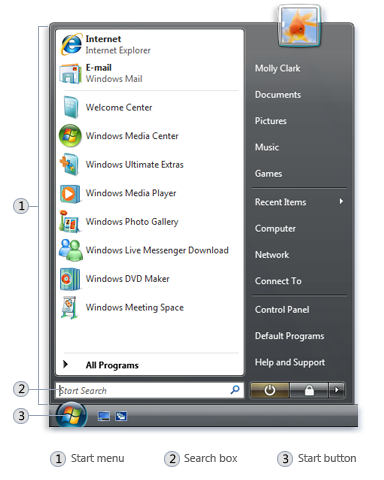 Second, the Start menu detects which programs you use the most, and it places them in the left pane for quick access. The Search box is one of the most convenient ways to find things on your computer. The exact location of the items doesn't matter—the Search box will scour your programs and all of the folders in your personal folder (which includes Documents, Pictures, Music, Desktop, and other common locations). It will also search your e-mail messages, saved instant messages, appointments, and contacts. To use the Search box, open the Start menu and start typing. You don't need to click inside the box first. As you type, the search results appear above the Search box in the left pane of the Start menu. Any word in its title matches or begins with your search term. Any text in the actual contents of the file—such as the text in a word-processing document—matches or begins with your search term. Any word in a property of the file, such as the author, matches or begins with your search term. Click any search result to open it. Or, click the Clear button to clear the search results and return to the main programs list. You can also click Search Everywhere to search your entire computer; or Search the Internet to open your web browser and search the Internet for your term. Besides programs, files and folders, and communications, the Search box also looks through your Internet favorites and the history of websites you've visited. If any of these webpages include the search term, they appear under a heading called "Favorites and History." What's in the right pane? Games. Opens the Games folder, where you can access all of the games on your computer. Recent Items. Opens a list of files you've opened recently. Click one of the files in the list to open it. Default Programs. Opens a window where you can choose which program you want Windows to use for activities like web browsing, editing pictures, sending e-mail, and playing music and videos. Help and Support. Opens Windows Help and Support, where you can browse and search Help topics about using Windows and your computer. At the bottom of the right pane are two buttons: the Power button and the Lock button. Click the Power button to turn off your computer, or click the Lock button to lock your computer without turning it off. Once locked, your computer cannot be used until you unlock it with your password. Clicking the arrow next to the lock button displays a menu with additional options for switching users, logging off, restarting, or shutting down. The Switch User option does not appear on the Start menu in Windows Vista Starter. You can control which items appear in the Start menu. For example, you can add icons for your favorite programs to the Start menu for easy access, or remove programs from the list. You can also choose to hide or display certain items in the right pane.